Simply beautiful scroll floor registers are crafted from solid bronze by Hamilton Sinkler. The bronze vent covers have a patina finish which will warm up any space. Our scroll floor registers will not rust like traditional steel vents. They may change color and gain more patina overtime as is natural for bronze. The solid bronze vent covers drop into your floor opening for easy installation. The scroll floor register design offers a unique look that can revamp your home or office decor. Each register is made with an adjustable damper which can be used to control hot or cold airflow. Try out our bronze vent covers, which are durable yet decorative, today! Note: The bronze vent covers have an approximate lead time of 10-12 weeks once order has been fully processed. Tip: When ordering the scroll floor register, it is imperative to order according to the hole opening found in the floor. The 12 x 12 bronze vent covers will fit into a hole opening measuring that size. Each scroll floor register faceplate has an additional 1 1/2 inches added for installation purposes. Want bronze vent covers in another finish or design? 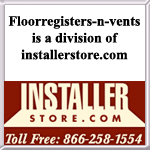 Check out our many options listed in our floor register section. Match your scroll floor register to your wall vents by also purchasing the Hamilton Sinkler bronze scroll wall register. Take advantage of bronze vent covers that will look great in your living space by ordering these beauties today.